If you follow my Facebook page, you might have seen last week that I posted a meme with a really excited Will Ferrell from Elf as the image, and the text, “JUST 10 FRIDAYS UNTIL CHRISTMAS!” (You can see it here if you missed it!) I counted on the calendar and it’s true! There are only 10 more Fridays until Christmas! How crazy is that!? 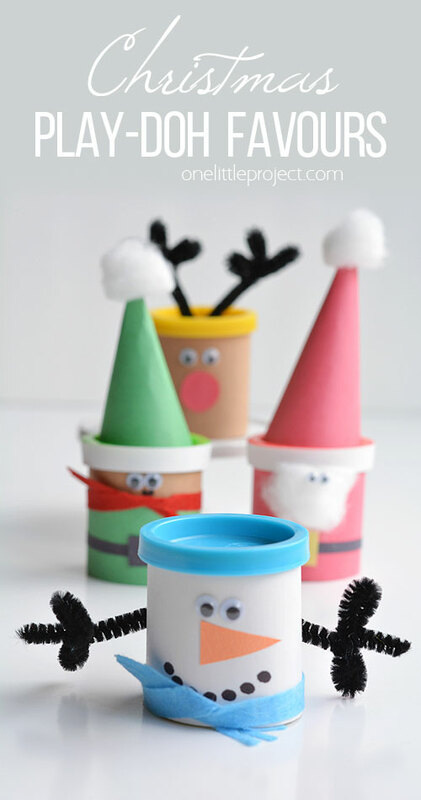 I had every intention of turning these play-doh tubs into monsters for Halloween, but when I saw that meme, I totally changed my mind and went for the Christmas theme. Do you have a special table for the kids when you have big family dinners? The kids in our family are just getting to the age where they can sit by themselves (phew, that’s a relief!) and they are loving it! The only problem is that they all eat like birds, so they gobble up three or four bites, and then they get up, run around and wreak some general havoc. My mom brilliantly bought little packs of crayons and colouring books for all of the kids. It was AMAZING. We gave them the colouring books and they were happy for at least 15 minutes and the rest of us could finish our meals. 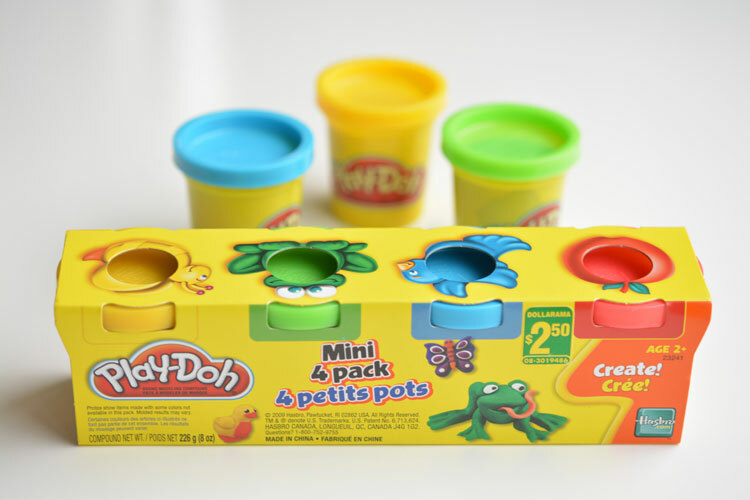 I think these Christmas play-doh favours would be perfect to distract kids during a family dinner! They would be a great activity to help keep those cute little bums in their chairs long enough for the grown ups to eat our dinners. Let’s be real – I’m not a miracle worker, so you probably won’t get to finish your whole meal without being disturbed, but hey, every little bit helps! I love that these also double as a non-candy treat. 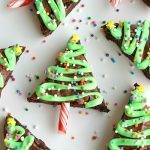 Halloween and Christmas are notorious for sugar packed goodies, so it’s refreshing to give something non-food related, especially if you want to send a little gift to your kids’ classmates. 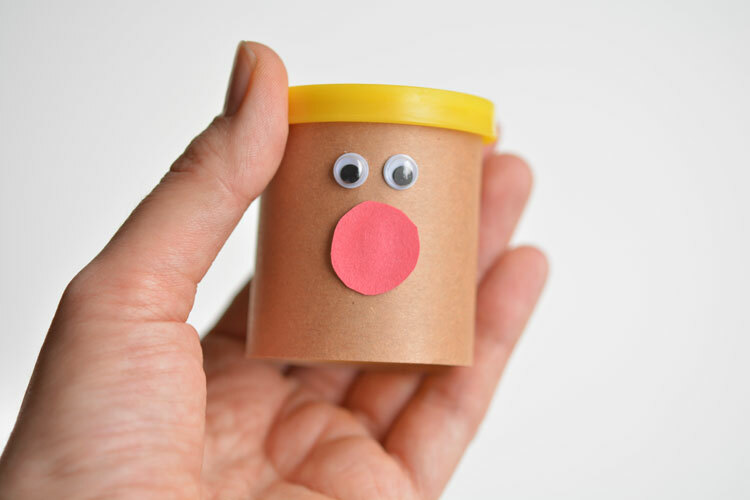 I used the mini tubs of play-doh from the dollar store. Each one is pretty small – 2 oz each I think? They aren’t the teeny tiny Halloween sized ones, but they aren’t the regular sized tubs either. The size was perfect for decorating! 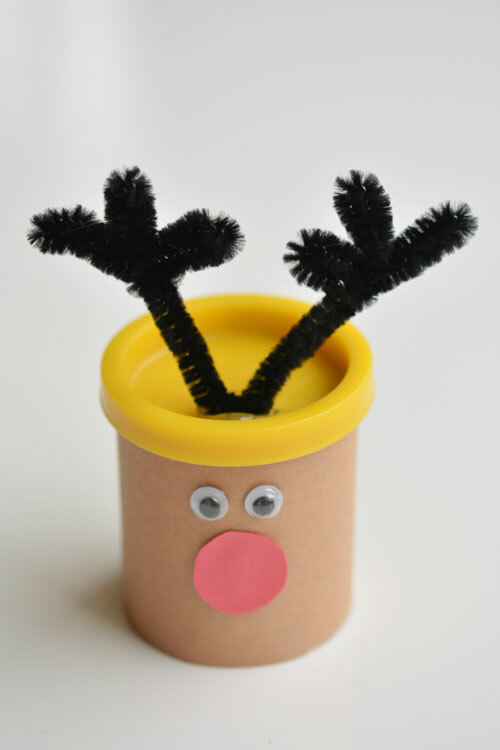 I started with the reindeer tub since it was the easiest one. 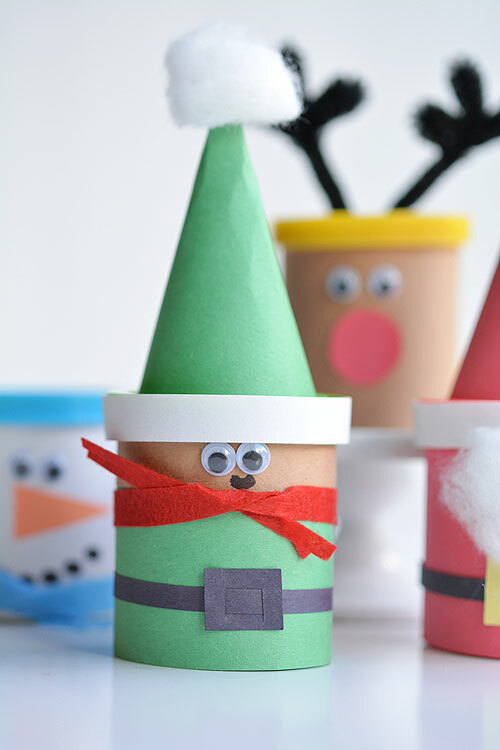 Wrap the construction paper around the tub and secure it with tape. Make sure the paper slides right under the lid part. I used a glue gun to attach the eyes, and a glue stick to attach the nose. 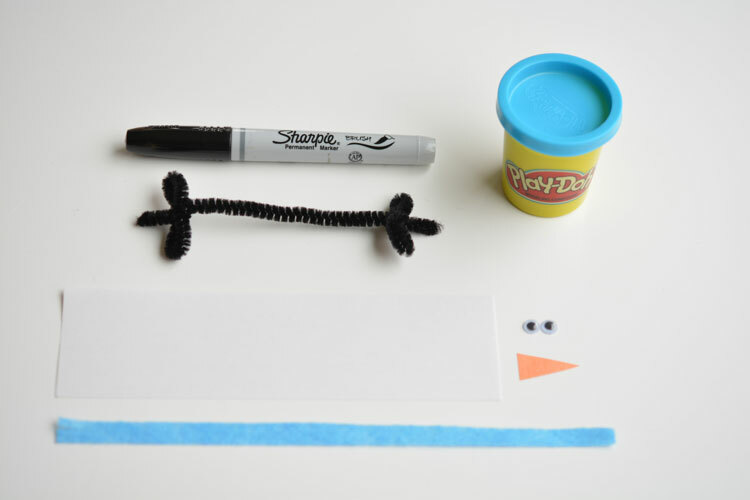 If the kids really want to do the eyes themselves, you could use white glue for them, but you’ll have to wait much longer for them to dry. The glue gun is pretty much instant. I used the glue gun to attach the pipe cleaner to the top of the tub too. 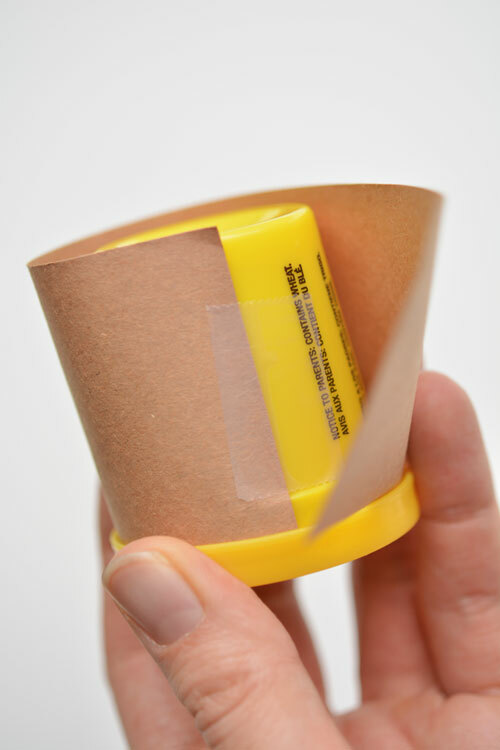 Tape will work really well to keep it on the lid too, it just doesn’t look as tidy. And one little reindeer all done! Easy peasy! The Santa had a few more pieces and a few more steps, but he was still pretty simple. 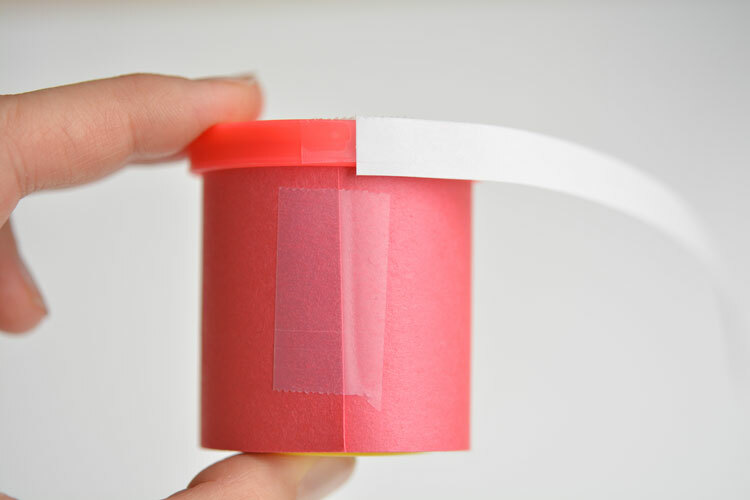 Tape the red construction paper around the tub, sliding it under the lid as you go. 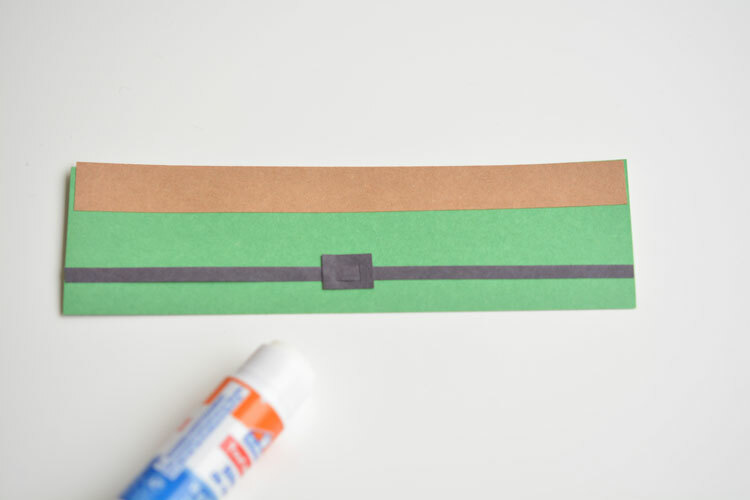 Then tape the white construction paper strip to the lid. 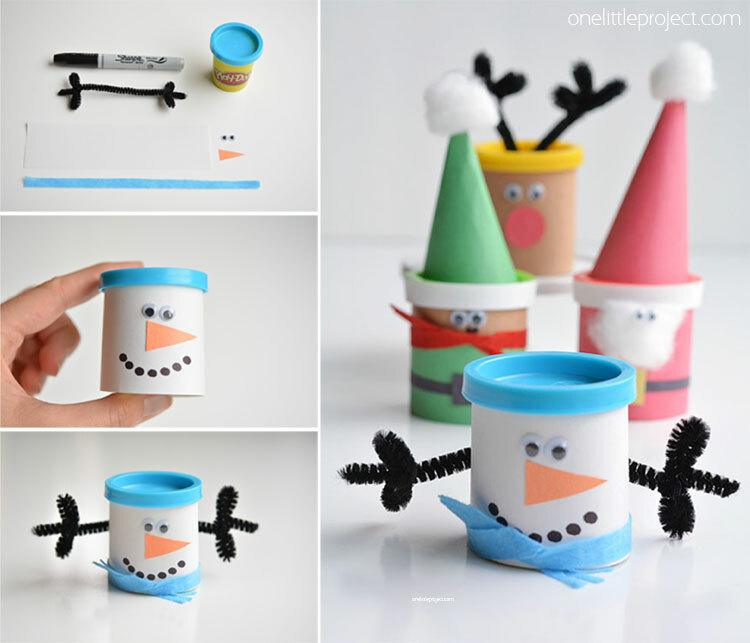 Glue it with a glue stick, and wrap it around the tub about 2/3’s down to make Santa’s belt. 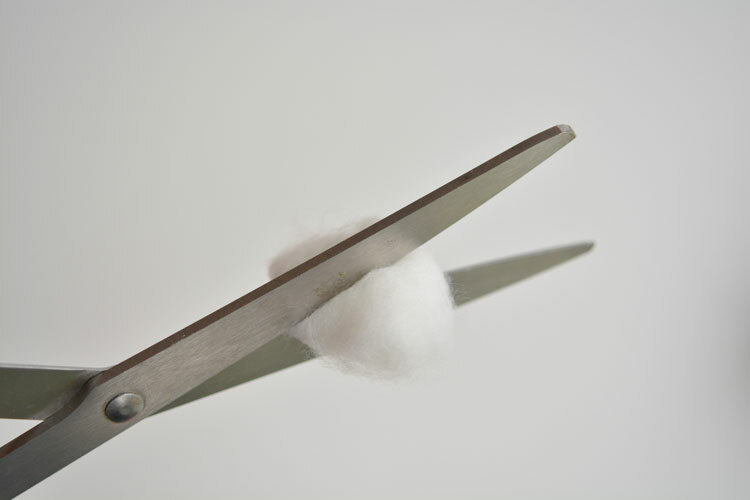 Cut the cotton ball in half. You might need to stretch it out slightly to get the scissors to cut through it. 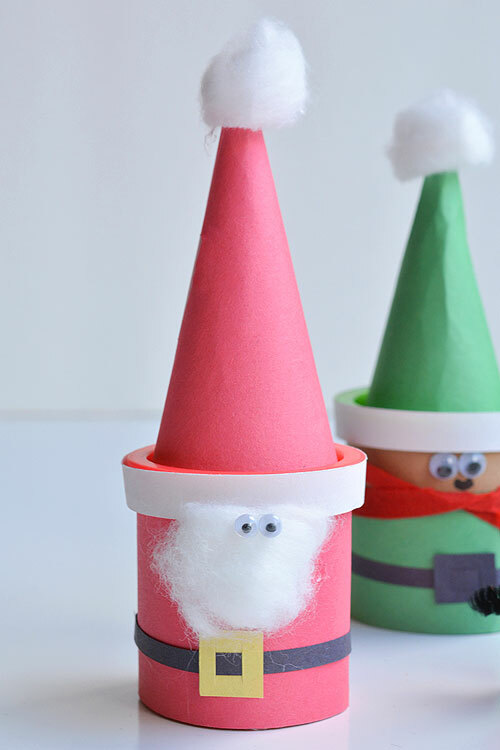 One half will be Santa’s beard and the other half will be the pom pom on his hat. 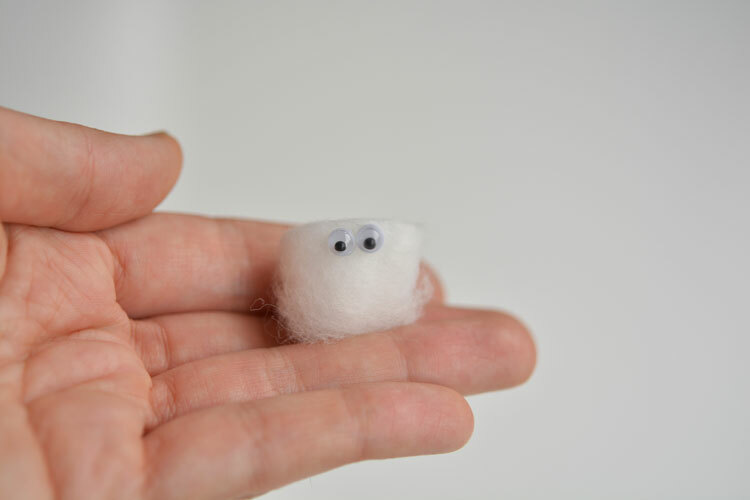 Glue the small googly eyes to the cotton ball half, near the top, so it looks like Santa is peaking out through his beard. Again, I used my glue gun here. Then use the glue gun to attach the beard to the body. It took a bit of maneuvering and three or four different spots of hot glue to get it to look right. In the end, I also had to hot glue the top part of the beard to the lid as well, just to shape it properly. 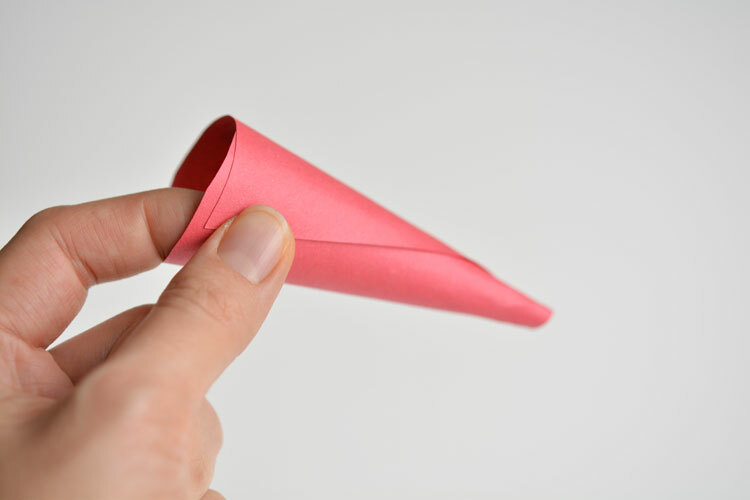 Make a small cone out of the red construction paper. 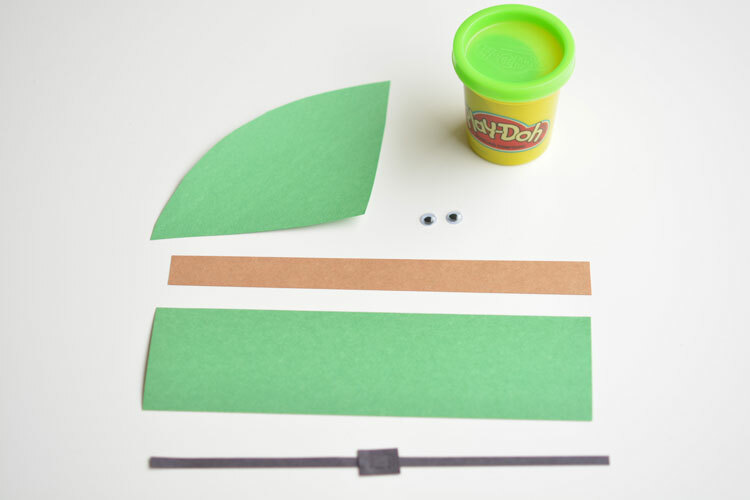 You want it to be as wide as the inner part of the play-doh lid. 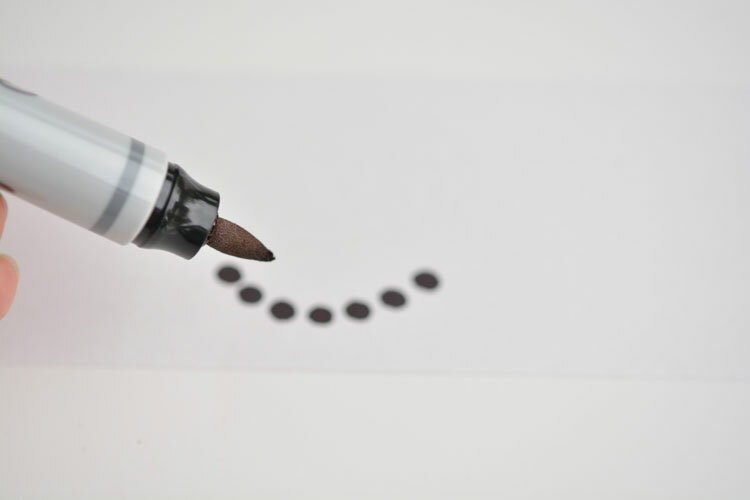 Just roll and cut the paper until it looks right. Don’t worry, it took me a few tries to get it right too. 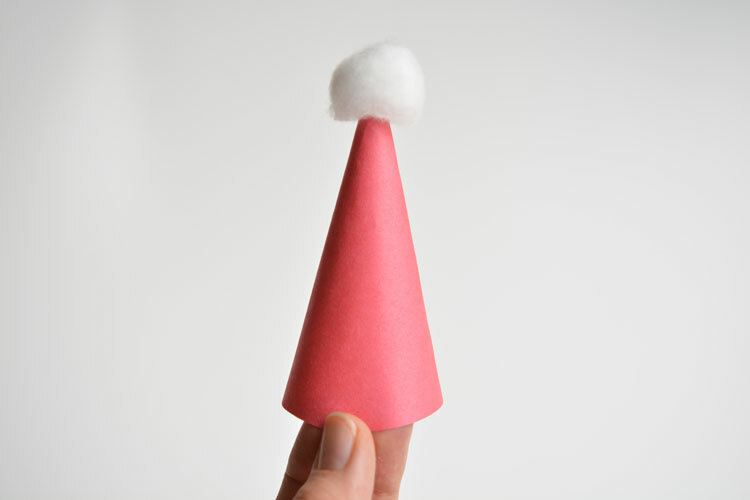 Take the other half of the cotton ball and glue it to the top of the hat. 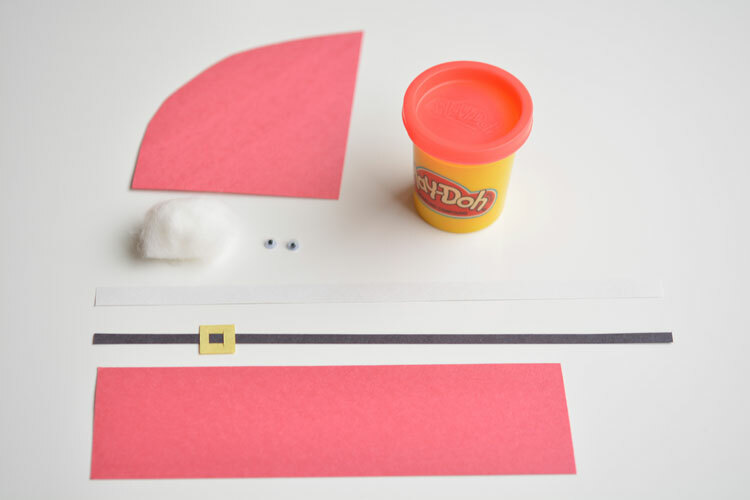 Then glue or tape the hat to the top of the play-doh lid. See? 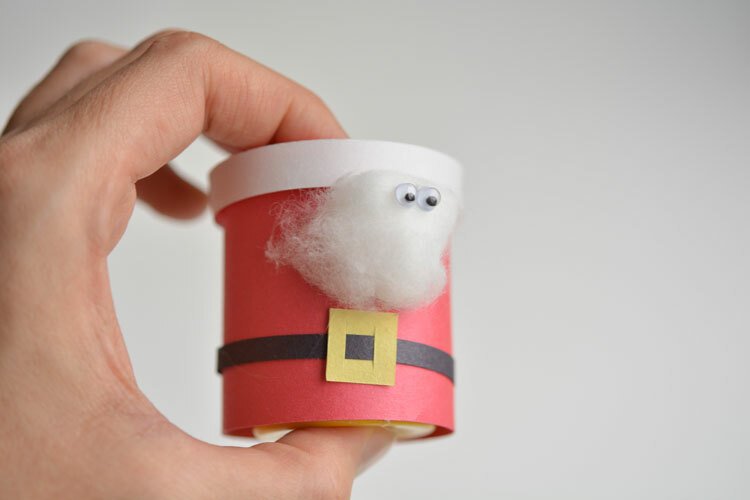 One easy little Santa tub! This guy was pretty easy too. 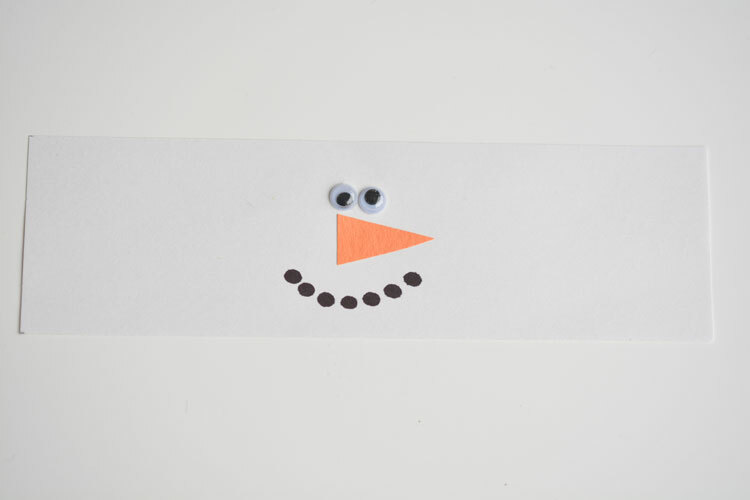 Using the Sharpie or marker, draw dots on the white paper where the snowman mouth should go. Sorry, it’s hard to see the white paper on the white background in the photos! 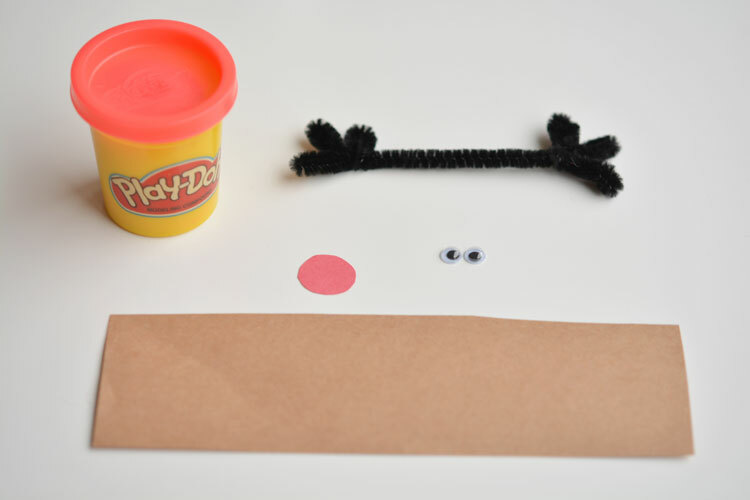 Then glue the googly eyes and the nose onto the paper. 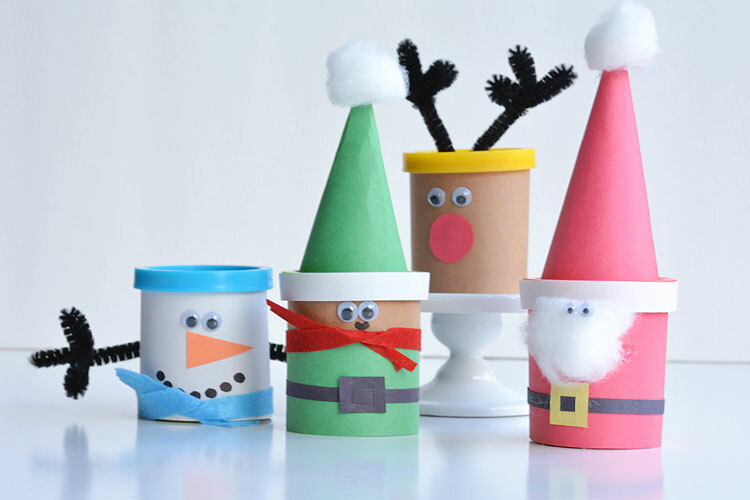 Wrap the white paper around the tub and secure it with tape, like the Santa and reindeer tubs above. 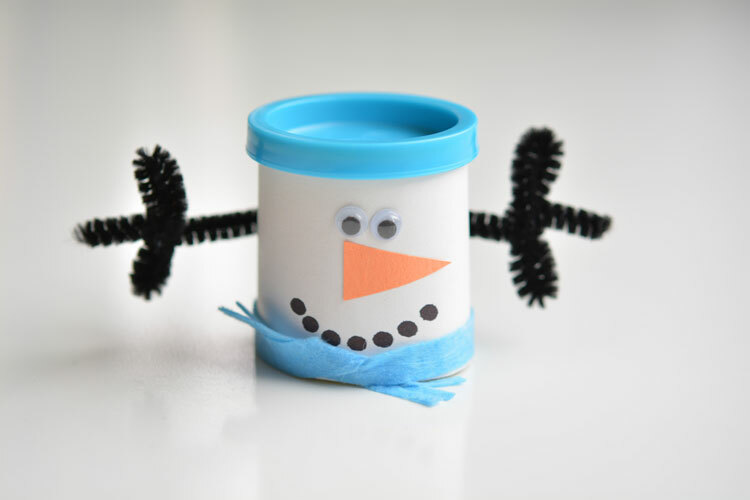 Tie the scarf around the bottom of the tub and tape or hot glue the pipe cleaner arms onto the back of the tub so they fully wrap around. Done! I wasn’t sure how I was going to make this one, so I added to it as I went along. The photo below doesn’t show all the pieces, so you’ll have to follow the list. Sorry! It was trickier than I thought to make a believable looking elf. 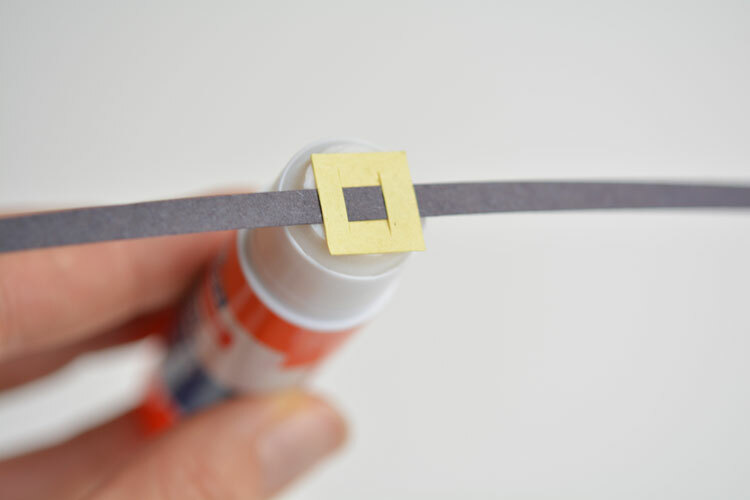 Glue the construction paper together as in the photo below. I think you get the picture for how to make these now, so I’ll just show you how he looked at the end. He was trickier for sure, but I think he turned out okay? 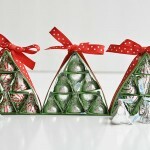 Wouldn’t these would make great favours for a Christmas party!? Just imagine them set out for the kids at the dinner table. My kids and their cousins would LOVE it! It’s hard to come up with good non-candy treat ideas! My girls were just itching to get their hands on these while I was taking pictures! My poor 3 year old asked after every single photograph if she was allowed to play with them yet. The reindeer went missing for a few photos before I realized she had sneaked it away to play with behind me! 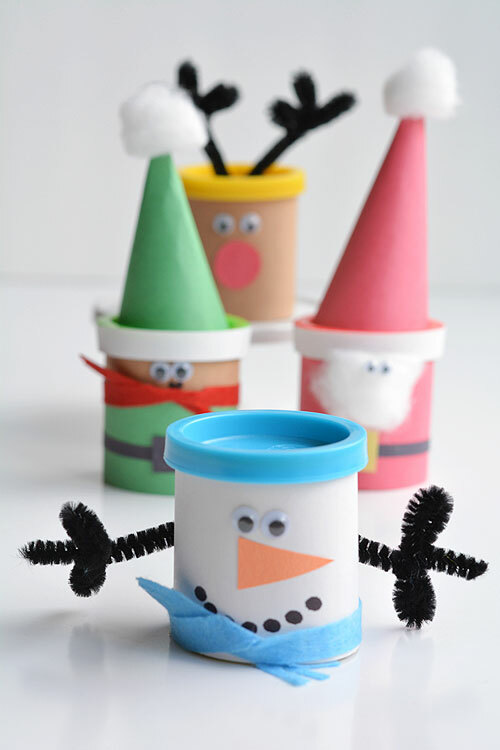 These Christmas Play-doh favours are really easy to put together and make the most adorable favours for any Christmas party! 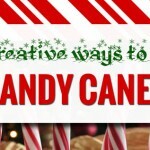 They are also a great treat idea if you’re looking for something non-candy or non-food to give to your kids’ classmates. 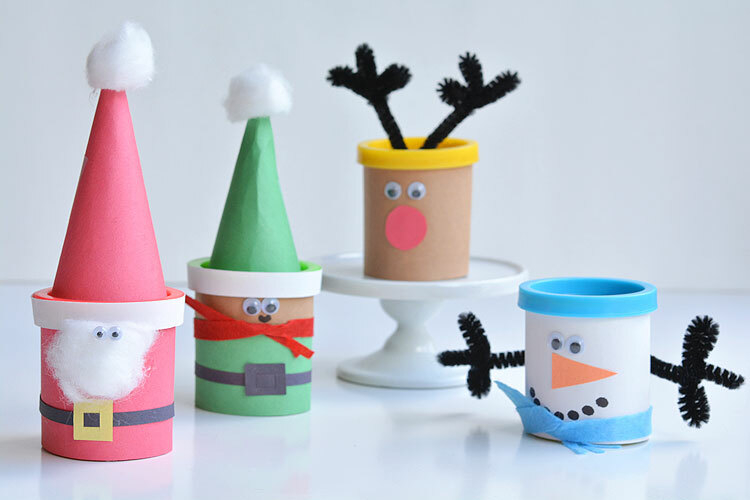 They go together quickly and end up looking pretty darn cute! These are adorable! I’ll be featuring your post on the next Brag About It link party! Hope you’ll join us! Debbie, these are absolutely the cutest! 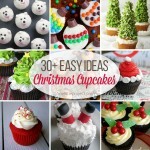 Visting from Giggles Galore and pinning! Have a happy weekend! These are so cute!! I’m definitely going to share them on Pinterest. Thanks for sharing at You’re Gonna Love It. These are adorable. 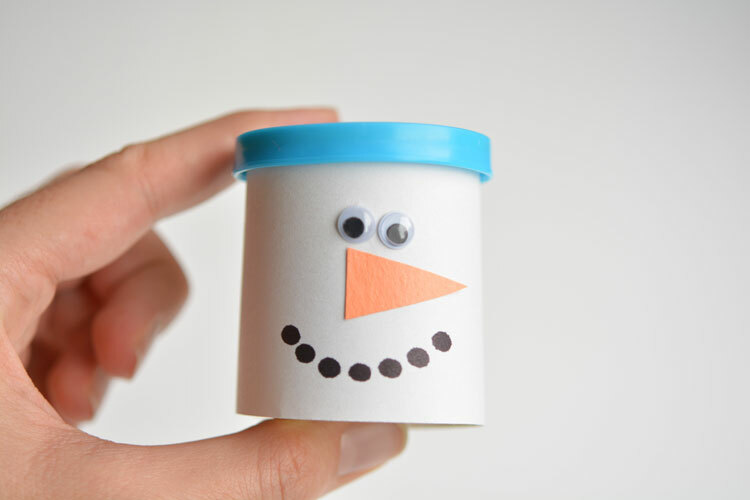 What a great idea for a party favor. 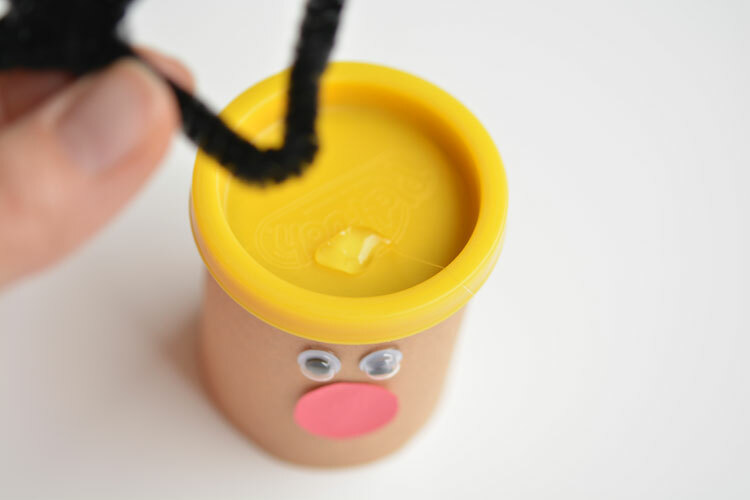 Something that you can use and enjoy.. and then pitch when the contents are finished! Oh my gosh these are adorable! What a great idea! These are so adorable! In my daughter’s class we aren’t allowed to send anything in that’s a food treat, so these would be a perfect alternative!